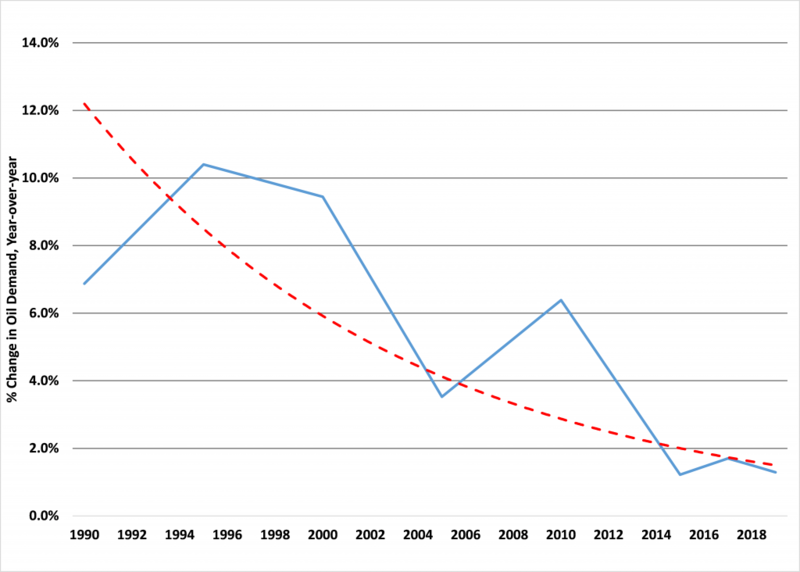 Before oil demand goes to zero, oil demand has to stop growing and then start diminishing. 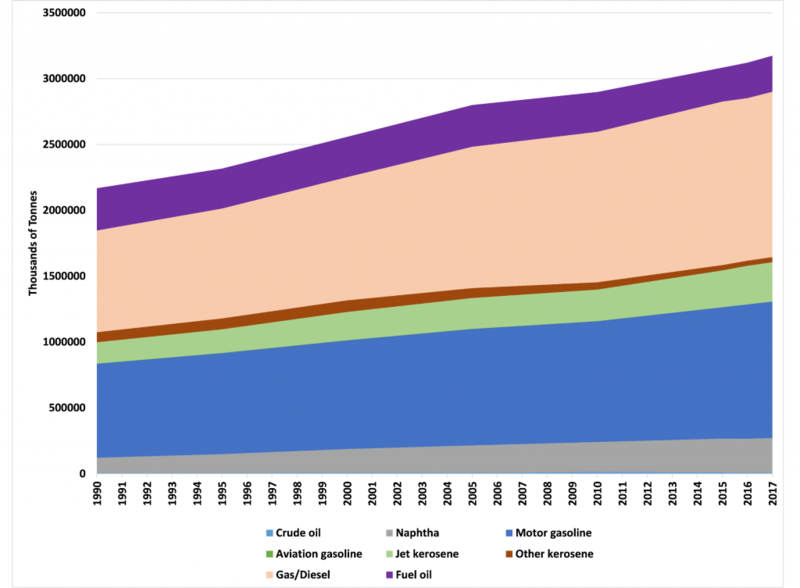 Historically, oil demand has been growing, Fig. 1. However the rate of oil growth, year-over-year, has been slowing. OPEC publishes annually and monthly an oil market report (MOMR) in which OPEC looks at just not member oil production but global oil supply and demand. In OPEC’s January 2019 MOMR , OPEC notes that 2018 oil demand growth was 1.5 mb/day (about 1.5% growth) and forecasts for 2019 that oil demand growth will be only be around 1.29 mb/day (or about 1.3%). Comparing this values to historical growth,it appears that the rate of that increase in oil demand is slowing, year over year (Fig. 2). Even though the absolute number of barrels of oil produced has still been increasing, the rate of growth is slowing down. A steady state of oil demand could be imminent. Most current forecasts see oil demand growth arising from developing economies and reductions in demand from developed economies (OECD type states). Again, referring to OPEC, but this time its World Oil Outlook, the presumption is that future oil demand growth will be from developing economies (Fig. 3). But I disagree. 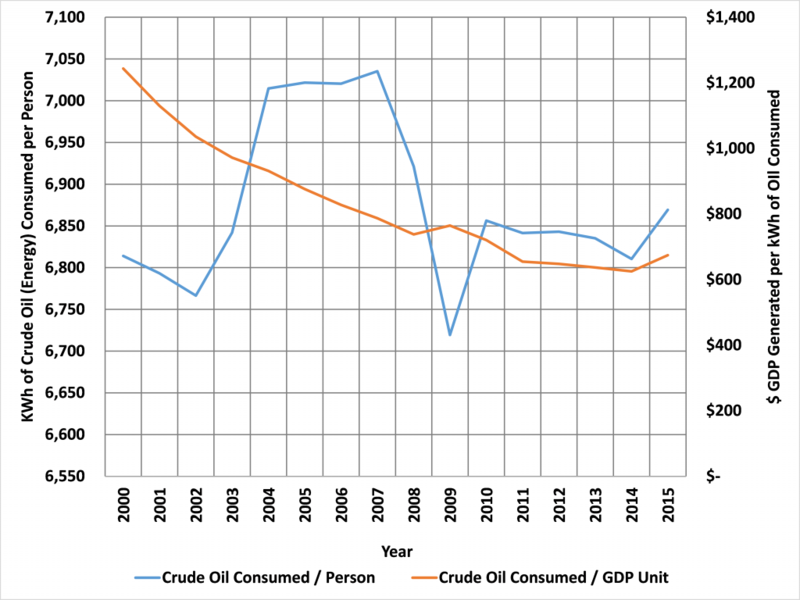 Instead of just looking at the total barrels of oil consumed, looking at oil consumption against population or GDP growth between the years of 2000 and 2015 (the most complete dataset that I can find) yields a different viewpoint. Looking at Fig. 4, it seems that the number of units of oil required per person is fairly consistent between 6700 to 7100 kWh per person, while the number of units of oil required per unit of economic activity has been steadily decreasing. As economies transition from agrarian, to industrial, to knowledge based economies, the energy required per economic unit decreases. There may still be oil demand growth due to population growth, but it is no longer certain that oil demand growth will be coincident with economic development. OPEC and others assume that developing economies will develop along the same path that OECD economies did, which is a high energy consumption pathway. However, it is far more likely that developing economies will develop alon a more energy efficient path, leapfrogging quickly into the low energy, high GDP range of oil consumption (for example, see Worldbank and The Economist). Oil producers should not plan on continued growth in demand from developing economies. Another obvious and somewhat feared factor that affects oil demand is a recession. Looking at the consumption graph (Fig. 4), it is interesting to note how abruptly oil demand per person dropped at the 2008 financial crisis and subsequent recession. It is also interesting to note that oil demand recovery after the recession appeared to plateau at a lower level than before the recession. That’s the Academic View of historical oil price movement effect on demand. In the short run, even when oil prices spike sharply, people cannot change their consumption habits fast enough to adapt to high prices: Commuters still need to commute and industries still need oil as a feedstock. However, in the long run (or after a successive series of oil price spikes), people and industries can change their consumption habits. In the long run, all other things being equal, high oil prices make alternative fuels and technologies much more competitive choices when compared to oil. So the more successful that OPEC+ is at curtailing oil production and driving up prices, the more attractive and more quickly alternatives will be adopted. Catch-22. V. How Will the Petro States React? What do the petro nation states do? Ending 2018, OPEC recognized that non-OPEC Supply growth was growing faster than oil demand. Hence, the frantic efforts by OPEC+ in November of 2018 to curtail production by 1 mb / day and again in January of this year to further cut production in order to balance oil markets. But with increases in non-OPEC production of the order of 2 mb/ day coming on stream in 2019, it is likely that OPEC+ will again need to cut oil supply to prop up prices. How long will OPEC+ and the Saudis, in particular, keep propping up oil prices? More importantly what will everyone start to do when oil demand starts falling (see Bloomberg)? At some point somebody may decide to produce the hell out of its reserves while there is still demand and then everyone else will be left to fight it out for market share. With the likely exception of Canada, Petro states will pump and sell as much oil as possible to capture as much money as possible before the oil party ends. There will be much coordinated talk of curtailment and production cuts, while on the other hand, individual states (e.g., Libya) will try to produce and sell as much oil as possible. Canada will most likely be the biggest economic loser in this scenario. When there is plenty of demand for all producers, there has been relative peace. But if demand starts to flatten or even diminish, how peaceful will the fight be to maintain market share?